The first-time or new parents find themselves in the midst of a mixed feeling mainly because of the sudden surge of responsibilities that come into their lives. The feeling of excitement and also the seriousness of this immense responsibility and the uncertainty of starting a journey of a new phase of life sometimes becomes burdensome for the parents. To ease this phase and help with parenting and childcare technology can be used. Some of the baby tech gadgets are meant specifically for this purpose. Obviously, the renowned tech companies always try to make their products in accordance with the needs of the child and make them as reliable as possible. A list of tech gadgets for new parents or first-time parents as well as gadgets for newborns is given to help you with choosing the most reliable and useful product according to your desire and choice. Most of these are a must-have if you lead the respective lifestyle while others just ease your job of parenting. This proves to be one of the most important tech gadgets for first-time parents who are busy throughout the day and are unable to come and check up their baby frequently. The baby monitor serves both the purpose of protection of the child as well as a way to see your child without actually being physically present nearby. So, you get to know whether your baby is crying, sleeping or playing throughout the day and never lose sight of him or her. With its lens changing technology, you can easily cover baby’s crib to the whole room. It also features LED lights which can help in silent mode, to let you know if your baby is crying. It can be useful for a newborn to a few year old babies. You can even control the camera lens remotely to cover blind spots. It supports pen, zoom or tilt control through the receiver. A humidifier controls the moisture content inside the room to suit the baby’s skin requirements. This tech gadget is a must-have if you have to protect your child from the pollution and dry air of the environment outside. A baby’s skin is more sensitive to dry atmosphere and may cause skin irritation. So, look for this in case you are in a dry air area which can cause skin irritation issues for your baby. 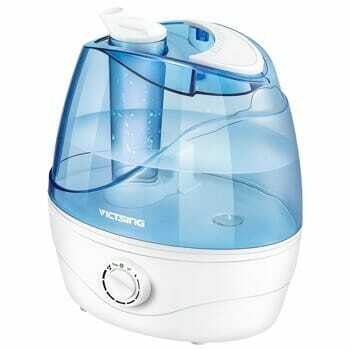 VicTsing Cool Mist Humidifier is super quiet so your baby’s sleep will not be disturbed. It is also easy to operate and clean, which will make sure you can use it long term. A humidifier is required mostly in the early stages and throughout the early infant phase of the baby. 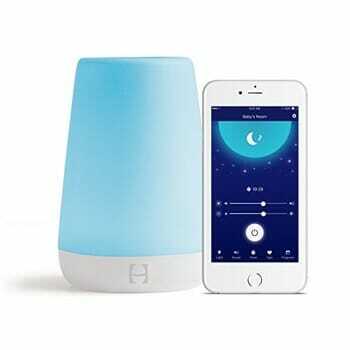 This is a multipurpose gadget which can be used as the night lamp, soothing sound machine or alarm. So It can be used for a long time in your kid’s bedroom. It gives the sound effects of the womb in the ears of the baby thus generating a feeling of comfort and composure that helps to put the baby to sleep. There are a number of devices that generate different types of white noise. This is one of the coolest gadgets for first-time parents who find it difficult to put their child to sleep. You can also connect it to your smartphone, with the help of the official app. This way you can customize the sound and light according to your kid’s age. You can also control it remotely so that your kid’s sleep won’t be disturbed. The body temperature of the baby needs to be maintained at a level so that it gives him or her comfort and helps in the growth and development of the body. 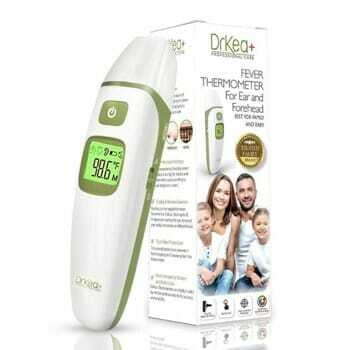 The ear and Forehead thermometer is just another thermometer which you can use to check the body conditions of the baby every now and then. It makes it very easy to take the temperature with it’s fast and accurate readings. You can use the Tri-mode to take the temperature of ear, forehead and milk bottles. This gives you an instant report on whether the baby is alright or not and takes actions accordingly. It also has a silent mode which can be used to check baby temperature while sleeping. This tech gadget is for the first-time mothers. Sometimes it becomes really uncomfortable to breastfeed in front of a gathering or in the midst of office work. The breast pump is extremely useful as it lets you store breast milk in bottles for uses during these times. 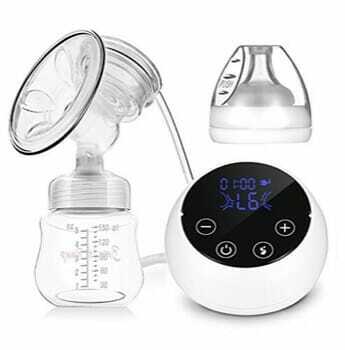 The breast pump additionally lets the mother put down the responsibility of childcare for a few moments and let some other people feed the milk in the bottles to the baby. Thus, the baby gets the nourishment required in his or her early age without the necessity of the mother to be around. This electric breast pump makes the milk collection process easy with different suction levels. You can also carry it along with you as it can be charged with USB charger. The breast pump is easily one of the best tech gadgets that helps the first-time parents in a lot of ways both directly and indirectly. This gadget for new parents is one of the primary things that is required to protect the baby from harmful germs and dust in the surroundings. These bottle sanitizers simply sterilize and kill the germs and bacteria in it with microwave radiation. 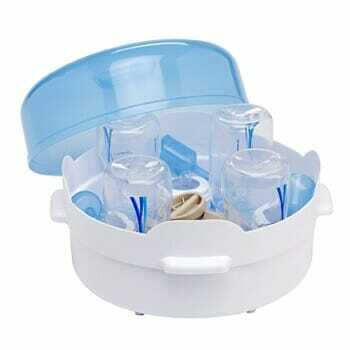 This one can sterilize up to 4 bottles at a time and make sure they are ready for use. It is made of plastic and for its own cleanliness, you can wash it in the dishwasher. In this way, most of the harmful entities in the feeding bottle or other common utensils of the child are cleaned and prepared in a proper way for the protection against harmful substances. Sometimes it is common for new mothers to have a glass of wine or a few drinks occasionally. In such cases, the breastmilk may become alcoholic that must not be given to the child. 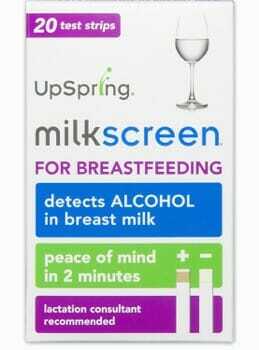 To test the alcohol content of the breastmilk the testing kit comes in handy. To allow yourself to indulge in occasional drinking during this phase of life you need to take precautions. One of the best ways is to use the breast pump to fill up some bottles beforehand. So that there is no need to worry about the breastfeeding part for a few hours or days. 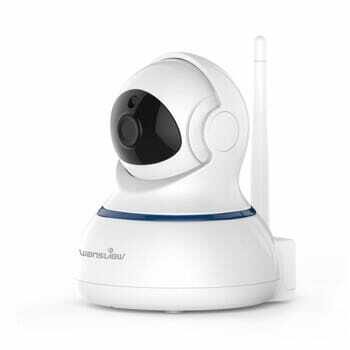 In the present world of notoriety, it is absolutely essential to install security cameras in different places in the house to keep an eye on what is going on in the house. This camera can stream the video in 1080p with 25 frames per second to give your clear pictures. You can record the videos with the help of SdCard or stream it on iPhone / Android. It can be controlled remotely with the help of IP address along with two-way audio support to provide clear instruction. It gives you peace of mind knowing that you can see your baby as and when required. This tech gadget also helps to keep an eye on a babysitter if you have employed one for caring for your child. A lukewarm bath is necessary for the hygiene of a baby. Most of the first-time parents ignore the fact that by testing the water by hand we only get an approximate and inaccurate measure of how hot the water really is. The bath thermometer floats on the surface of the water and continuously updates the temperature of it so that the ideal bath conditions can be maintained. 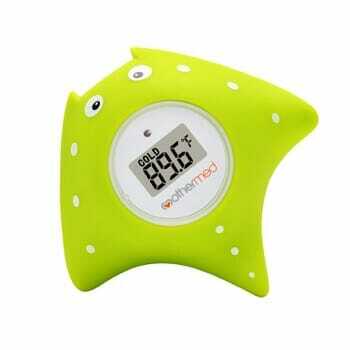 Though we have mentioned only one you can buy bath thermometer in all shape and sizes. Choose what your kids like best so that they can play along with taking bath. All the gadgets mentioned above show that technology has indeed made the task of parenting smooth and efficient. All the gadgets described are approved and recommended by child specialists and experienced doctors.